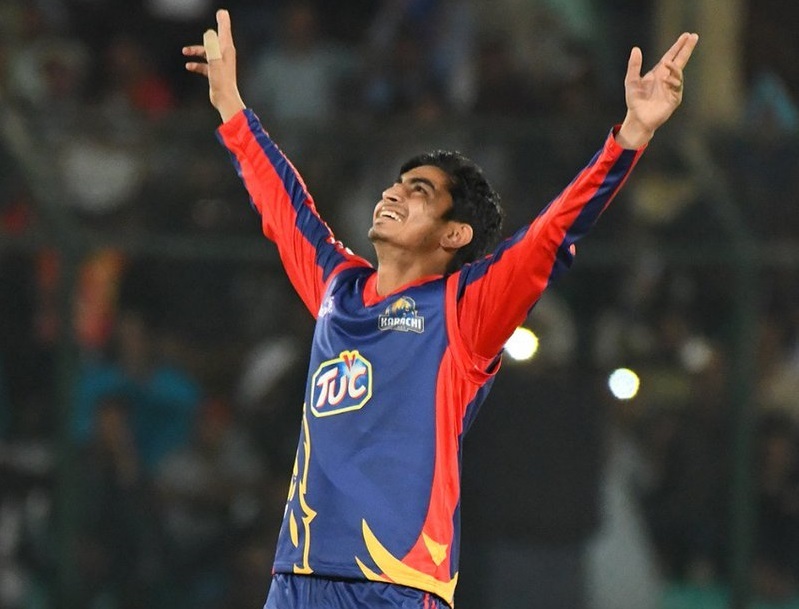 Playing for Karachi Kings, left-arm spinner Umer Khan at 19 years of age ended up as the joint fourth highest wicket-taker in his debut season at the recently concluded fourth edition of the Pakistan Super League. In an exclusive interview with PakPassion.net, Umer spoke on a variety of topics including his impressions of playing in the PSL for Karachi Kings, experience of playing under Mickey Arthur, his most memorable wickets at the PSL and his aspirations to represent Pakistan at the T20 World Cup in 2020. PakPassion.net: How was the experience of playing in the PSL? Umer Khan: I had a wonderful and enjoyable time at the PSL, and it was an honour to play in Pakistan’s main Twenty20 tournament which is something many other players dream of doing. On top of that, I got a great chance to observe and learn from some top international players by spending time with them in the dressing room and also by playing alongside them. Also, to play in such fantastic stadiums such as the ones in Dubai, Sharjah and Abu Dhabi and the jam-packed National Stadium in Karachi was amazing and an experience which I will remember forever. PakPassion.net: Your debut game for Karachi Kings in the PSL must have been a memorable one? Umer Khan: Before the start of the tournament, we had a practice game and I did well in that game, picking up a few wickets so that must have impressed our coach Mickey Arthur who told me that I would be playing in Karachi Kings' tournament opener against Lahore Qalandars. This was like a dream come true for me as not only was I part of the Karachi Kings squad in the PSL, but I was also asked to debut in the first game of the tournament for my side. PakPassion.net: What sort of advice did you get from your fellow senior players during the PSL? Umer Khan: I was constantly being given advice by seniors which was really important for me as I am still learning the ropes when it comes to playing in such a top-level tournament. However, one incident I remember is that when I had been hit for two sixes and was feeling a little anxious, Ben Dunk came over to me immediately and told me take some deep breaths to calm myself before bowling the next ball. He told me to always do this if there is pressure mounting and to talk to senior players on the field for advice as that helps one gain confidence and also reduces any tension that is building up inside you. PakPassion.net: Having Wasim Akram and Mickey Arthur as your mentor and coach must have been a great experience? Umer Khan: Working with Pakistan’s Head Coach and the legendary Wasim Akram was another amazing experience. They both taught me about many aspects of bowling such as how to read a batsman in order to bowl the right ball to him. Apart from being experts, they also are great human beings and treated me with great respect and I have to say that I was honoured to work with both of them. PakPassion.net: Do you feel that you impressed Mickey Arthur enough to play international cricket in future? Umer Khan: I certainly hope I have impressed him, and he did ask me to continue working hard and told me that if I performed well, then there will come a day when I will play for Pakistan. If I am being honest with myself and based upon how I have played in the PSL, I do feel that I have the ability to play international cricket and God Willing, I will make full use of any opportunity to play for Pakistan if I am ever given the chance to play for my country in the future. PakPassion.net: How do you feel about the fact that when you went into the PSL, you were not that well-known but now everyone knows about you? Umer Khan: It’s a strange feeling and obviously one that I am enjoying too. Before I played for Karachi Kings, not too many people knew about my bowling or even recognised my face. But all that has changed now. In fact, when I was on my way to the UAE to play in the initial stages of the PSL, all the people would ignore me and move towards the well-known players but on the way back, it was a completely different situation. Throughout my journey back home, I was recognised and so much respect was given to me that all I can do is thank the Almighty that He has bestowed His mercies on me. My success is obviously a matter of great pride for my family as well and they are very pleased too. When I arrived home, I was given a great welcome not only by my family but from the people of my area as I am the first person to have reached such a high level of cricket from the locality and that is a great honour for everyone. I am also getting a lot of meal invites after my success so that is an added bonus! PakPassion.net: You took the wickets of some big names in the PSL but which one was your favourite dismissal? Umer Khan: Obviously, it was something special to get the wickets of some of the top players in the PSL like Luke Ronchi, AB de Villiers and Shane Watson. Getting such players out also helped me build a lot of confidence in my abilities as it told me that I had the ability to battle against the best players in the world. But if there was one wicket that I will remember for a long time, it has to be that of Lahore Qalandars’ AB de Villiers. I had always wished that I would get a chance to bowl against this great batsman and that is what happened. In fact, not only did I get to bowl to him, but I also took his wicket. What is most pleasing is that to get his wicket, I followed the advice of my senior players who told me that AB de Villiers steps back to hit the ball so I should try and cramp him for room, so I followed that plan of action and got the outcome that I wanted. PakPassion.net: What role did Rashid Latif play in your selection for Karachi Kings? Umer Khan: I played List A games for United Bank Limited in domestic cricket for a few years but when the side was disbanded, Sui Southern Gas Corporation asked me to come and play first-class cricket for them. I debuted for them in November 2018 where I picked up 7 wickets and helped my side to a 108-run victory. It was then that I was recommended to Rashid Latif as a good candidate for a left-arm spinner for Karachi Kings. Rashid knew me from before and he put in a good word for me with Karachi and I was then picked by Karachi Kings for the 2019 PSL. PakPassion.net: What was it like to play in front of a jam-packed home crowd at the National Stadium? Umer Khan: I must say that this being my first experience of such a major tournament, I really enjoyed playing in the UAE as well. There weren’t that many supporters in the stadiums there, but it was still enjoyable for me as the grounds were of high quality and the facilities were excellent as well. But then when we moved to Karachi, we got to experience the fun of playing in front of jam-packed crowds. It was just a different experience playing in front of our own people and on our home ground. It was like something you dream of as a child where you imagine walking out onto the field with thousands clapping and cheering for you. I suppose my dream came true in Karachi and this experience is something I will always remember. PakPassion.net: What were your impressions of Imad Wasim as captain at the PSL? Umer Khan: I was very fortunate to play under the captaincy of Imad during the PSL. His advice was really helpful for me as he spoke with a lot of authority due to his own international experience as a world-class spinner. During PSL, we had a very good spin combination going and he would always give me tips about where to bowl to specific batsmen so as to stop them from scoring and to get their wicket. I do believe that playing under his captaincy helped me become a better spinner and also added to my enjoyment of the PSL. PakPassion.net: Now that you have had a good PSL, what are the plans for the upcoming domestic season, especially in the Pakistan Cup? Umer Khan: I have been fortunate that I have been selected to represent Balochistan in the Pakistan Cup. I feel that this is a great opportunity for me to continue showing my skills to the world and to perform really well and pick up as many wickets as possible. Who knows, maybe a good showing in this tournament could lead to me playing for my country in the future. PakPassion.net: Do you think there is a possibility for you to be selected for Pakistan’s World Cup squad? Umer Khan: What I intend to do is to continue to work very hard and the upcoming Pakistan Cup will be another opportunity like the PSL, for me to perform at my best. My objective is to do well in this tournament and if I do that, and it is in my fate, then I will be ready to represent my country at the World Cup. I feel I am ready for international cricket if my country needs me. Even if I am not able to make it to the World Cup squad this time around, I am still hoping that I'll be able to impress the selectors for next year’s T20 World Cup so there’s a lot to look forward to and aim for. Has a lovely arm ball and can turn the ball too. I think he can be the spinner Pakistan are looking for. We still have time, select him for Aus and if he does ok send him with WC squad too. I dont get the hype behind non-spinners Imad and Yasir. And no Umer's competition is not Shady. Playing 2 SLA spinners in same team dont make any sense. Shadab and Umer should be our 2 spinners going into the world cup who can take wickets in middle overs. Could have been a wild card in the WC as Wayne Parnell said but now not selecting him Aus series shows that master planners dont have any plan for him. For those who think he cant spin the ball. But Inzi doesn't want you. You need to trained by Yasir Shah to learn how to bowl his special "Hit me Hard" delivery. The only good things about Karachi Kings this season were Umer Khan and Colin Ingram. This kid should be in UAE playing against Australia instead of Yasir Shah. Good performance in Pakistan Cup should make him a very good candidate for the World Cup - one hopes! Please wait not now, no grooming for youngsters. Just throwing them raw will always back fire. Good performance today on a 300 pitch. No point in selecting a specialist spinner , and that too a non leg spinner. He can only make his case strong by working on his batting. Misses out on the World Cup but World T20 is within his reach. Good start to his list A career, beat the bat a few times. Nice to see him flight the ball with decent control. One thing worth noting is he seemed more comfortable bowling to r/h, and his control vs l/h isn't as good yet but promising signs. All SLAs prefer bowling to RHB's. Not until Inzi there. He may award debut to his buddy Yasir. Correct, but I was talking about control. Bowled more defensively in his second game. Not sure why. Could be a future star this lad. Great attitude and very skilled. All times are GMT 5.5. The time now is 11:24.